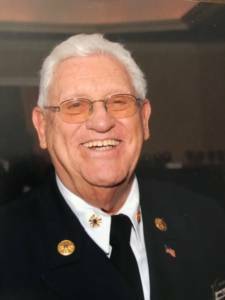 It is with deepest regret the Centereach Fire Department announces that 59 year Life Member, Ex-Chief, Past Commissioner and Past President: Joseph A. Seiberlich has answered his last alarm. Joseph Seiberlich joined the Centereach Fire Department on December 21st 1958 and was assigned to Engine Company # 2. Joseph Seiberlich quickly rose through the ranks of the Department; beginning in 1960 he served as the Treasurer-Secretary of the Department. In April of 1961 he was elected 2nd Lieutenant of Engine Company # 2, followed by 1st Lieutenant in April of 1962 and Captain of Company 2 in April of 1963. He would enter the Chief’s ranks in April of 1964 being elected 2nd Asst. Chief, followed by 1st Assistant Chief in April of 1965, and finally Chief of the Department in April of 1966 serving 1 year term until 1967. In January of 1968 Joseph Seiberlich was elected to the Board of Fire Commissioners serving 3 terms until December 31st 1982. In 1969 Joseph Seiberlich became a charter member of Hook & Ladder Company # 1 until the company’s merger with Rescue Company # 1 in July of 1976 and became Emergency Company # 1. Joseph Seiberlich remained a Firefighter until the Early 1990’s when he would transfer over to Fire Police Company where he would serve the remainder of his time with the Department. In January of 1993 Joseph Seiberlich was elected the first ever President of the Department serving a 2 year term until January of 1995. In 2008 Joseph Seiberlich achieved 50 Years of Active Service in the Centereach Fire Department and was honored at the Annual Installation and Inspection of Officers dinner for his Achievement. Over the years Joseph Seiberlich served on the Department Firematic Training Staff and ran the Probie Fire School during the 1970’s. In 1975 Joseph Seiberlich received the award for Firefighter of the Year from the Chief’s Office. He would also receive the Captain’s Award in Emergency Company in 1990, and in Fire Police Company several times in the 2000’s and received the High Point award in Fire Police in both 2007 & 2008 for both Fire & EMS alarms. Joseph Seiberlich remained an Active Member until July of 2013 with almost 55 years of Active Service in the Department. We are deeply saddened by the loss of our Chief and brother firefighter. We wish to send our deepest sympathies to his family, friends and loved ones and thank Chief Seiberlich for his many years of dedicated service to our Community and Department. Rest Easy Chief we got it from here.